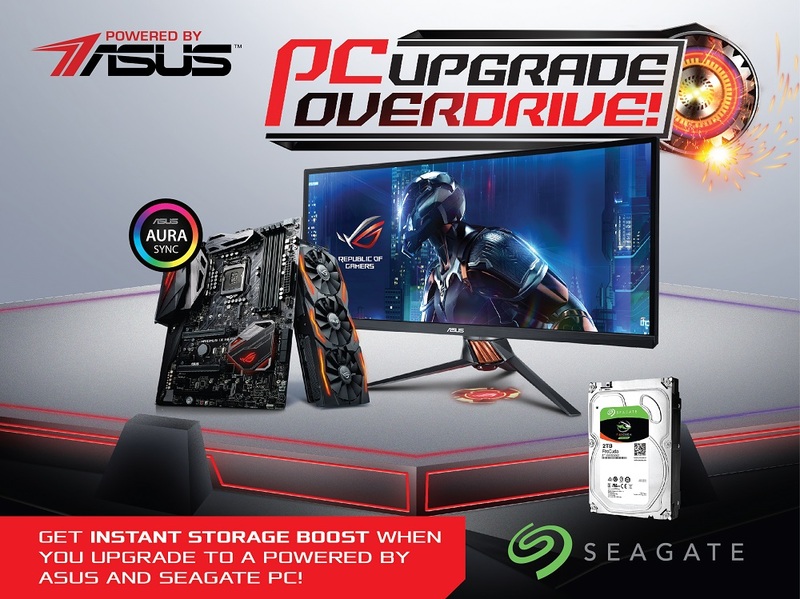 Now is the perfect time to get your dream PC with ASUS and Seagate! Starting February 6 to March 31, 2017, endusers will get an instant upgrade of their storage if they purchase a DIY PC set that’s powered by ASUS and Seagate. Requirements for the upgrade include purchase for a set of any ASUS Kaby Lake motherboard (Z270, H270, B250), any ASUS graphics card, any ASUS LCD, and a 3.5” 1TB Seagate FireCuda Hard Drive. The promotion is open to all customers who will purchase select ASUS components and Seagate Hard Drive. The promotion runs from February 6 to March 31, 2017 only. All employees of ASUS, its partners, and agencies including their relatives up to the second degree of consanguinity or affinity are disqualified to join the promo. ASUS Kaby Lake motherboards: built for performance, customizability, and aesthetics. The ROG Z270 lineup has redefined its features for performance enthusiasts, water-cooling veterans, and gamers who demand cutting-edge design and technologies. The new ROG family provides the best gaming audio with the exclusive SupremeFX audio codec, best air- and water-cooling innovations, best auto-overclocking performance, plus many refined design choices and class-leading features. ROG Strix gaming motherboards combine bold aesthetics, premier performance and incredible SupremeFX audio to deliver unrivaled gaming experiences and style. ASUS Prime is the next evolution of the ASUS motherboard. Our team of world-class engineers are passionate about empowering everyone to enjoy the benefits of DIY PC customization, tuning, making advanced enthusiast controls easily accessible. It features 5-Way Optimization wituh Fan Xpert 4, SafeSlot core, and ultra-fast transfer speeds using up to two dual M.2 slots and USB3.1 connectivity. TUF is where ambition for reliably brilliant performance meets reality. We are so confident of the reliability and durability of our products that each and every TUF motherboard is backed by a five-year warranty. It features the world-renowned TUF military components, TUF Thermal Armor, Dust Shields, TUF Ice Temp processor, Thermal Radar 2+ and TUF Detective 2. Aura Sync and 3D-printing-friendly designs provide stylish customization for awesome gaming rigs, and they are available with ASUS Kaby Lake motherboards. The latest ASUS graphics cards are packed with exclusive ASUS technologies, including DirectCU III with a patented triple wing-blade 0dB fan designed to deliver maximum airflow for 30%-cooler and three-times (3X) quieter performance, and ASUS FanConnect, which features GPU-controlled fan headers for targeted supplemental cooling. Industry-exclusive Auto-Extreme technology with Super Alloy Power II components ensures premium quality and reliability. ASUS ROG STRIX graphics cards enable complete gaming system personalization with Aura Sync. A VR-friendly design with two HDMI ports lets gamers always keep a virtual reality (VR) device connected to their system for immersive gaming anytime. It also includes GPU Tweak II with XSplit Gamecaster for intuitive performance tweaking and instant gameplay streaming. Being recognized as the #1 gaming monitor brand, ASUS has completed its lineup of award-winning products. ASUS displays are not just made for gaming, but also for everyday usage. Equipped with user-sensitive features such as Eye Care Technology with Ultra-low Blue Light and Flicker-free technologies. Gaming monitors feature breakthrough refresh rates, outstanding color accuracy, and exclusive GamePlus and GameVisual Technologies. Play faster, work smarter. FireCuda drives meld the latest NAND flash technology with a traditional hard drive for a compact blend of capacity and speeds up to 5× faster than typical hard drives, all backed by a 5-year warranty. FireCuda delivers superior performance compared to a standard hard drive, yet provides the high capacity options you’ve come to expect from a hard drive solution. It’s the perfect upgrade for gamers, creative professionals and PC enthusiasts. FireCuda delivers faster load speeds for nonstop performance and play, saves time with a drive that boots in seconds, not minutes, and gets in the game up to 5× faster than traditional hard drives.